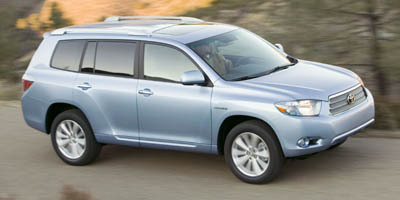 As a pioneer in hybrid technology, Toyota scores big with the 2008 Highlander Hybrid. And when we say big, we mean it. Boasting a third row of seats, the Highlander is roomy and well appointed for the mid-size SUV class, but its actual dimensions are smaller than you would expect. For that reason, the Highlander can maneuver through crowded city streets just as well as it does in suburban wide-open spaces. If you are intrigued by hybrid technology and looking to stretch your gas budget - but also need a dependable people mover at a reasonable price then look no further. You'll get noticed in this eye-catching ride while feeling good about doing your part to save the environment. Fuel economy is at a premium with this Highlander, certainly as compared with its mid-sized SUV classmates. The console is simple and clean with an optional navigation system that is very intuitive. Beyond that, we were pleasantly surprised at how well it handles and by the smooth, quiet ride even when powered by the fuel engine at higher speeds. The keyless ignition is a challenge. There is a few seconds delay between engagement and ignition. More troubling is that the hybrid engine is so quiet that when it does turn over, any street noise makes it difficult to know. The regenerative brakes take a long time to engage, but when they do, they grab the pavement abruptly. We give the Highlander Hybrid high marks in its performance. Transitions between the hybrid and fuel-powered engine are very fluid. The overall ride is very smooth, both at low speeds and on the highway too. Running on the electric motor is very quiet of course, but we also found that the Highlander stays pretty quiet at high speeds after it transitions to the fuel engine. Perhaps most compelling is how well the SUV handles; it doesn't feel like a heavy truck, but instead, maneuvers elegantly through traffic, into tight parking spots and around town. This four-wheel drive 3.3-liter V-6 hybrid produces 209 horsepower and 212 lb-ft of torque. The 123-kilowatt electric motor produces 167 horsepower and 247 lb-ft of torque. Toyota offers interesting options with the "EV" and "Econ" driving modes. In the EV setting, it solely runs on electric power which can be used at low speeds and for very short distances and, as such, has limited utility. However, in Econ mode, the vehicle sacrifices acceleration impact for better fuel economy. It's a nice option for driving in traffic, especially with four dollars and up for a gallon of gas. The instrument panel displays the average fuel economy, average speed, distance to empty and current fuel economy. The car also features a keyless entry that allows the car to unlock as you approach it without having to press any buttons, as well as a keyless start engine. A helpful attribute to the hybrid is the rear backup camera so you can see behind your vehicle while you back up. Unlike other hybrids, the Highlander has two electric motors, one for the rear and one for the front that produces 50 kilowatts and 123 kilowatts, respectively. The Highlander also has an automatic start/stop gas saving mode. There is an in-dash single CD player and auxiliary audio input. We did find the audio output a little tinny. 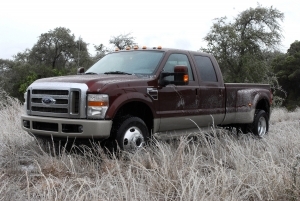 It is equipped with Electronic On-Demand four-wheel drive that will automatically engage when necessary. The steering wheel houses the necessary audio controls. The Toyota Highlander Hybrid gets 27 mpg in the city and 25 mpg on the highway. This hybrid earns nearly twice as many miles to the gallon as a regular SUV, and receives an SULEV-II emissions rating. Surprisingly there is over 42 inches of legroom in the front but only 29 inches in the rear, making for a tight fit. The rear bench seat splits 40/20/40 for extra cargo space and when completely folded down you have up to 94.1 cubic inches of space. The Highlander comes equipped with a towing package standard that includes 3,500-lb towing capacity. The rear has a fixed lift-gate window and tailgate to access the cargo area. Starting at $33,700, the Highlander is a budget choice compared to the Chevrolet Tahoe Hybrid, but pricier than the Saturn VUE Green Line. But note, the base price is $5,500 above the non-hybrid model. The Highlander Hybrid hits the mark on a number of levels. First, it offers a smooth ride with great hybrid mileage. Also, with its useful third row and extra seating capacity, the Highlander Hybrid is a great choice for the family looking for dependability and utility in a well-designed package. Well worth a look, hybrid or not.